As per the requirements of the customers, we are involved in offering best quality of Cellular Lightweight Concrete Block Plant. This Cellular Lightweight Concrete Block Plant is extensively used in various suitable industrial applications. The Cellular Lightweight Concrete Block Plant is known for its premium quality. Our hydraulic concrete block making machines provide easy, Eco-friendly and low cost to quicken the construction works. These machines are of egg laying type in which, they lay blocks on the concrete floor and move forward. All our machines have sturdy construction with best quality components, grounded/hardened shafts and steel fabricated wheels. We set-up CLC PLANTS (STEAM WATER CURING) ranging from 10m3 to 250m3 Production Capacities with Very Less Investment and also in a Very Short Span. 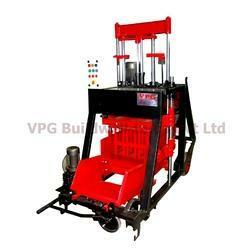 · We Are The Manufacturers Of Aac Block Making Machines. · We Are The Manufacturers Of Clc Block Making Machines. With our vast industrial experience, we are engaged in offering wide array of CLC Brick Mkaing Machinery. Keeping in mind the requirements of various industries, these CLC brick Making Machines are made with perfection in accordance with the industry set guidelines.